Across the country, from Madison to Wall Street to Oakland and everywhere in between, there is a call that cuts across issues to put people before profit. The Occupy movement’s recognition that people’s wellbeing has been systematically and repeatedly sacrificed in the name of corporate profit has brought unprecedented numbers to the streets. The Occupy protests which are challenging and inspiring the country condemn our current mode of business and demand a more just economy and government that works on behalf of public interest. 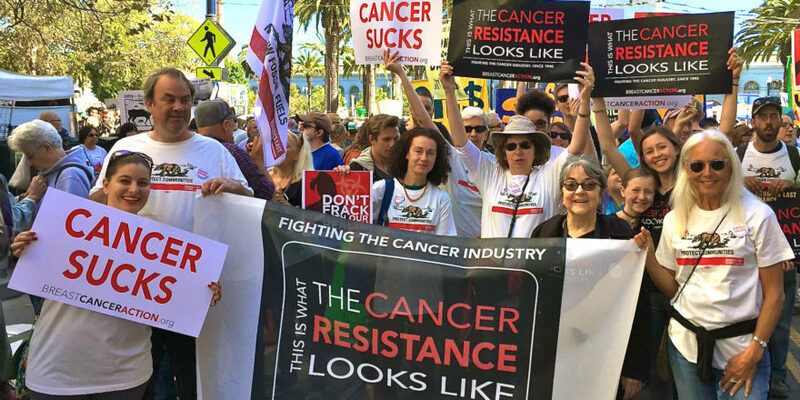 The same elements—profit-driven focus, short-sighted decisions, and refusal to follow what is just and right—that have led people across the country into the streets to protest, are also fueling the breast cancer epidemic. The staff and Board of Breast Cancer Action have been inspired and energized by this clarion call for people before profits, and are proud to stand in solidarity with the Occupy movement. For 20 years, Breast Cancer Action has agitated and advocated for systemic changes that remedy the fact that our regulations, laws, and policies benefit corporations, siphoning profits to the nation’s wealthiest 1% with too little regard for the well being of the 99%. Women at risk of and living with breast cancer are negatively impacted by these upside down priorities through lax FDA oversight, corporate greed, exposure to harmful chemicals, and the commodification of our bodies. We know that breast cancer does not develop in a vacuum; the social, racial, and economic injustices that have led so many people to demand change, are injustices that drive and shape the breast cancer epidemic. Women of color and poor women bear the burden of these injustices—as well as unequal incidence and outcomes when it comes to breast cancer. We know that these injustices can only be addressed through system-wide changes. The vision of the 99% movement is a U.S. and a world with a more equitable distribution of wealth, power, and health. This is a vision we share. We are aligned in our focus on justice that can only come by putting people and patients first. The concentration of wealth and power that brought us our economic crisis is also driving our health crisis. There is a growing collective call demanding that our economy and our government work to benefit everyone. Standing together, demanding that people come before profits, we have the power to reshape our economy, our society, and our health. As the great Audre Lorde, whose The Cancer Journals has educated and inspired many of us at BCAction, said: “When I dare to be powerful – to use my strength in the service of my vision, then it becomes less and less important whether I am afraid.” May we all dare to be powerful in demanding, and creating, systems that work for the benefit of all people. Interesting comments on “profits” and the whole protest. No profits equals no money for research on breast cancer, no research on toxic chemical free cosmetics, no develpoment of “safe” foods to eat while protesting, no cell phones, no TV and so on. I think that everyone would be better off focusing on “no ripoffs” and “no fraud” and more truth and honesty and “fairness”.